Herpetology is the study of reptiles which has always been historically combined with that of amphibians. Reptiles are any of various usually cold-blooded egg-laying vertebrates often grouped in the class Reptilia, having dry skin covered with scales or horny plates and breathing by means of lungs, and includes snakes, lizards, crocodilians and turtles. In some classification systems, birds are considered to be reptiles because they are descended from reptilian dinosaurs. The word amphibian means two-lives. Amphibians spend their lives in the water and on land. All amphibians begin their life in water with gills and tails. As they grow, they develop lungs and legs for their life on land. Amphibians are cold-blooded, which means that they are the same temperature as the air or water around them. There are more than 4,000 different kinds of amphibians. Members of this animal class are frogs, toads, salamanders, newts and caecilians or blindworms. 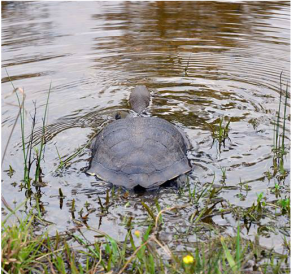 Turtle being released © WRSC Gavin Swan. Do not handle frogs without wet hands as they are susceptible to bacteria carried on the human skin, so minimize contact with them. Some reptiles go into shock when they have had trauma. This makes them dazed and compliant (easy to handle). BEWARE, as they emerge from shock, they can suddenly become active and aggressive. Many reptiles carry ticks. Generally speaking one or two ticks on a reptile poses no threat and will eventually drop off without any help. Lizards eat snails, so if you want to have a lizard-friendly garden do not use snail bait as it will also poison the lizards. It is important that people be wary of snakes and take proper precautions when outdoors between September to May. Snakes aren’t normally aggressive and will only bite when provoked or hurt. Wildlife Rescue South Coast suggests if you see a snake, leave it alone and walk away. NEVER try to catch or kill a snake.